Varicose veins are easily recognized in many people as bulging leg veins on standing or sitting. Unlike other lumps on the legs, when lying down, varicose veins will empty and disappear. This is because the veins are filling from underlying veins that have lost their valves, and blood falls down the veins by gravity. This blood falling the wrong way is called “venous reflux”. This venous reflux fills the surface veins or “tributaries”. When this has been going on for a long time, the walls of the surface veins can stretch, causing the visible varicose veins. In many cases, the blood refluxing down the leg veins on standing or sitting also causes a colour change at the ankle. The skin can appear more red or blue. When lying down and lifting the leg, the blood drains out and the colour goes back to normal. This simple test can be used at home to see if you might have varicose veins or “hidden varicose veins” deeper inside the leg. About 15-20% of adults have varicose veins visible on the legs. However, what is harder for many people to understand is that another 9-20% of adults have “hidden varicose veins” that cannot be seen on the surface. If varicose veins were only “cosmetic”, then this would not be a problem. However, as it is venous reflux that causes varicose veins and hidden varicose veins, this will cause the veins to deteriorate until the reflux is treated. Indeed, research shows that about 1 in 20 (5%) of people with varicose veins will deteriorate each year if they don’t have their veins treated. As noted above, for centuries the medical profession has focused on the bulges themselves as the problem, often thinking the bulging ‘varicose veins’ are the problem. 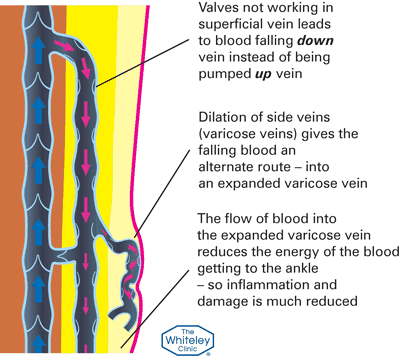 However, research in recent decades has shown that the veins appearing on the surface only do so because the veins deeper inside the leg have lost their essential valve function, allowing blood to flow the wrong way down the veins – venous reflux. So the traditional kind of treatment – still offered by some practitioners – that is directed solely at the veins seen on the surface, without either investigating or treating the underlying cause, is bound to fail. The problem is worsened further by the fact that, until recently, medical opinion held that only two principal veins could become ‘varicose veins’. Many doctors still only check and treat these 2 veins! However, studies – including research conducted by The Whiteley Clinic – has now shown that the condition can affect a large number of different veins such as incompetent perforator veins and pelvic vein reflux. If a doctor doesn’t have access to the correct diagnosis from a detailed scan in the first place, he or she is unlikely to be able to perform a complete treatment that will minimize the risk of recurrence. A single doctor working in a room by themselves, and doing their own scan is not able to check all of these veins and also be an expert in treating them. Hence NICE – The National Institute of Health and Care Excellence recommends that patients with varicose veins are referred to teams of professionals working together, and able to perform duplex ultrasound scans and ALL of the new techniques needed to treat varicose veins. This was recognized by Mark Whiteley in 1998, 15 years before the NICE Guidelines, and is the reason why The Whiteley Clinic have always worked in such teams. At the The Whiteley Clinic we have always placed great emphasis on performing comprehensive diagnostic tests and scans – based on a foundation of Duplex Ultrasound Scanning (Link to internal WC page of Duplex Ultrasound – in advance of the development of any treatment plan. This is a key part of our strict adherence to The Whiteley Protocol® and it ensures that all of our investigations are performed by independent experts who specialise in Duplex Ultrasound examination of the veins. You can compare our approach with the trend in recent years where doctors in ‘cheaper’ varicose vein clinics perform their own scans to try to keep prices down – despite the recommendations by NICE. This is a false economy as it has been shown that missing incompetent perforating veins or pelvic vein reflux are two of the commonest reasons that varicose veins come back after treatment. 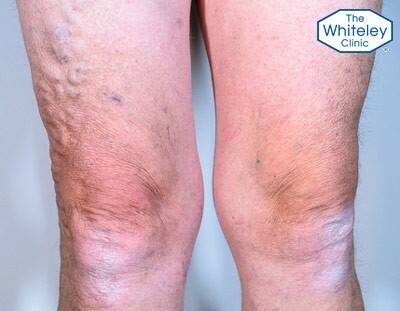 This contrasts with our own results showing that after 15.4 years of follow-up, the risk of varicose veins recurring after treatment at The Whiteley Clinic with The Whiteley Protocol®, is the same per year as people who come from a family with varicose veins running in it, but who don’t have varicose veins themselves. Hence, it is impossible to get a lower risk of recurrence than we achieve. But then, as with so many things in life, cutting corners to reduce costs usually means a reduction in standards, which in terms of varicose veins means varicose veins come back again quicker and more often. Put simply, it is a clear case of “Buy cheap, buy twice”!